Discussion of the road safety issues surrounding motorized transport modes should focus not just on the safety of in-vehicle passengers (passengers using the motorized modes) but also on how motorized modes affect the safety of other non-motorized users of the roadway system, such as pedestrians and cyclists. Keeping this in mind, the safety analysis discussed below is based on an assessment of the contribution of various motorized modes to pedestrian fatalities, based on real-world data for Mumbai and Bangalore. The analysis specifically explores the safety characteristics of auto-rickshaws by comparing their contribution to pedestrian fatalities relative to other motorized modes. Data for Mumbai and Bangalore were obtained from the Mumbai Traffic Police and National Institute for Mental Health and Neuro-Sciences (NIMHANS), respectively. Motorized modes selected for the analysis include buses, cars, motorized-two-wheelers (MTWs), and intermediate public transport (auto-rickshaws and taxis). The Mumbai Traffic Police maintains records of involvement of motorized road transport modes in accidents and their contributions to fatalities. 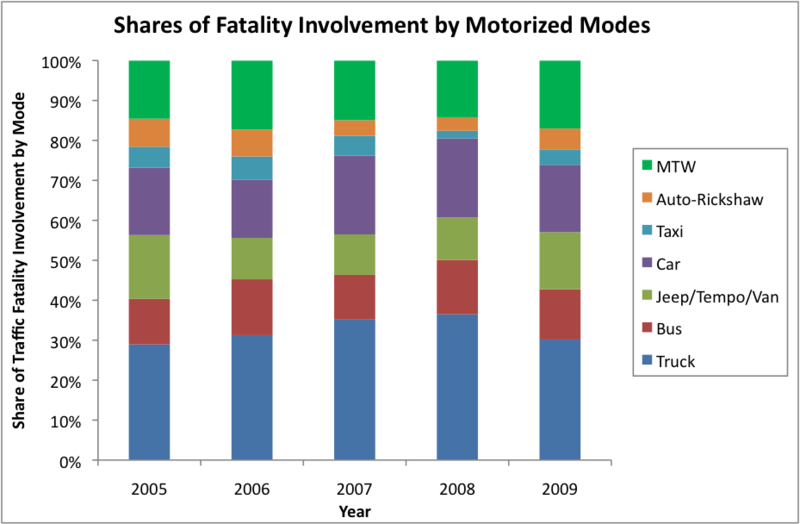 The figures below show historic trends (2005 to 2009) in the contribution of the various motorized modes in Mumbai to road traffic fatalities. 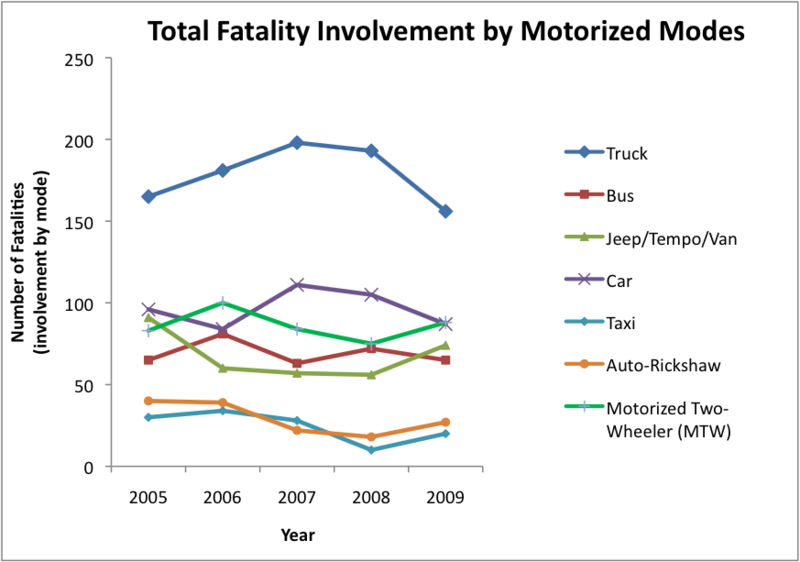 This data includes all fatalities, both in-vehicle as well as pedestrians and cyclists. Since contributions to just pedestrian fatalities were not available, it was assumed for this analysis that the relative contribution of motorized modes to pedestrian fatalities would be the same as that for all fatalities. This assumption is corroborated by the fact that, in 2009, more than 70% of the road fatalities in Mumbai were pedestrians, according to traffic police data. The figures below show that auto-rickshaws and taxis have consistently had the lowest involvement in (and contribution to) road fatalities in Mumbai compared to all other motorized modes. NIMHANS’ Department of Epidemiology, which is the World Health Organization’s (WHO’s) Collaborative Center for Injury Prevention and Safety Promotion in India, has been leading a project called the Bangalore Road Safety and Injury Prevention Programme (BRSIPP) since 2008, in partnership with the City Traffic Police, health care institutions, municipal corporation, metropolitan transport corporation, and a few NGOs,. 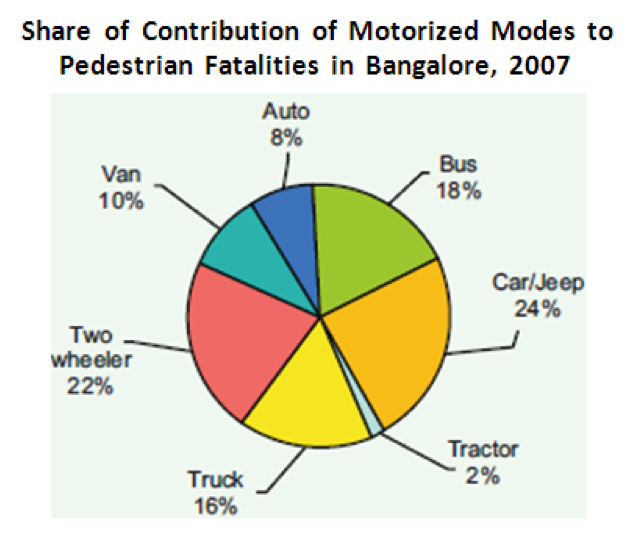 The aim of the project is to collect systematic and standardized data on road traffic deaths and injuries in the city, to “develop road safety and injury prevention programmes based on data and evidence and by scientific approaches.” The figure below shows the share of contribution of motorized modes to pedestrian fatalities in Bangalore in 2007, using data available from BRSIPP. This source also reported that there were 500 pedestrian fatalities in Bangalore in 2007, which accounted for 52% of the total road fatalities. The figure below shows that auto-rickshaws have among the lowest contribution to pedestrian fatalities in Bangalore among major motorized transport modes. In order to assess the safety of auto-rickshaws in terms of contributions to pedestrian fatalities, the above statistics need to be compared in relation to the modal shares of vehicle kilometres traveled (VKT). A transport mode would be considered safer for pedestrians compared to another mode if the ratio of its share of pedestrian fatality contributions to its share of VKT is lower than the other. 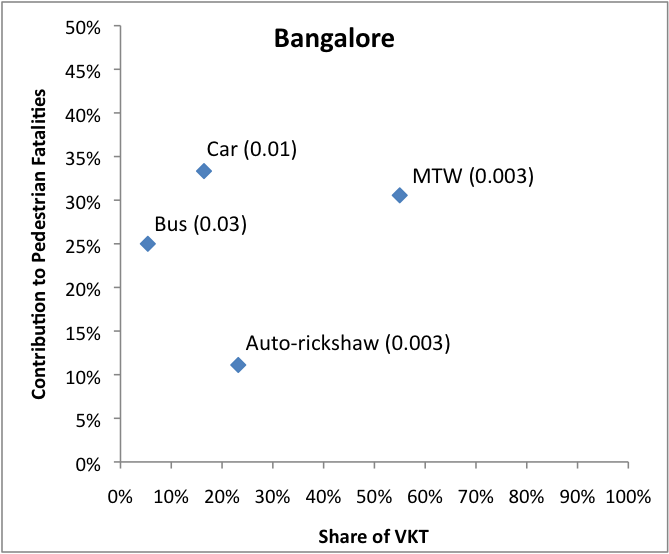 VKT data for motorized modes for Mumbai and Bangalore were obtained from Mumbai’s Comprehensive Transportation Study and Bangalore’s Comprehensive Traffic & Transportation Plan (CTTP). 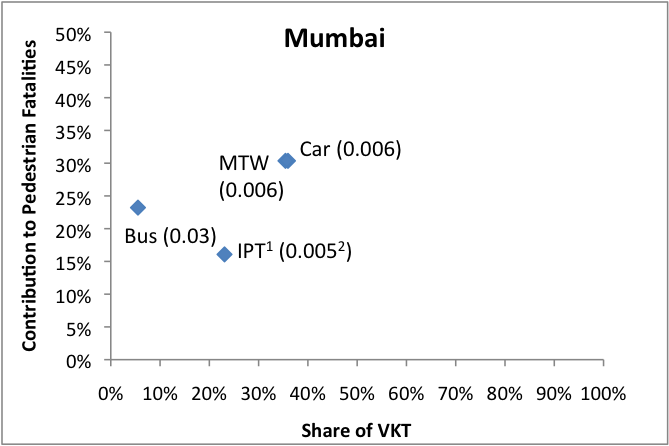 To facilitate the safety analysis, the key modes (cars, buses, motorized two-wheelers, and auto-rickshaws/taxis) are represented on a fatality contribution versus VKT graph, as shown below. 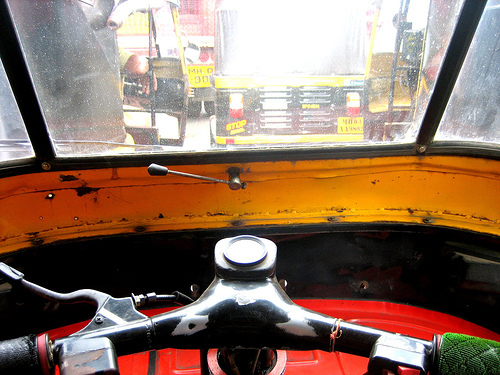 Auto-rickshaws have the lowest contribution to pedestrian fatalities in both Mumbai and Bangalore. This is consistent with anecdotal evidence gathered earlier (and reported in a previous blog post) on the characteristics of auto-rickshaws that make them relatively safer for pedestrians, such as their lower speeds, smaller size, and easy maneuverability to avoid conflicts. Cars are less safe for pedestrians compared to auto-rickshaws in both cities, and cars are the largest contributors to pedestrian fatalities in terms of absolute numbers in both cities (note that trucks were not included in this analysis.) With pedestrian fatalities accounting for a large share of total road fatalities, focusing not just on in-vehicle safety but safety for all road users should be the yardstick for policy makers to assess the safety implications of expected increase in car ownership and usage in the future. Further, the push towards replacing auto-rickshaws with four-wheel vehicles (such as Tata Magic Iris) using the in-vehicle safety argument could potentially be detrimental to pedestrian safety and should be given further attention. As a side note, buses in both cities are found to be the least safe for pedestrians. This issue beckons further analysis to understand the underlying causes, and potentially look at the need for strategies such as bus rapid transit (BRT) systems in these cities as a way to enhance pedestrian safety. As discussed earlier, developing policies for injury and fatality prevention on Indian roads should unequivocally address the issue of pedestrian safety. Real-world road fatality data from Mumbai and Bangalore fill a critical gap in the understanding of the pedestrian safety impacts of various motorized modes. Given the inferences from the data presented above, promoting sustainable transport solutions — public transit solutions, such as BRT and other mass transit, and intermediate public transport, such as auto-rickshaws — while at the same time addressing issues such as adequate non-motorized transport infrastructure, could potentially pave the way towards a safer future for a large share of our road users, who are pedestrians.